Emily St. John Mandel’s slim debut, an elegy for a broken relationship, leaves a greater impression in memory than it makes in reading. Lilia is a chronic runaway, constantly on the road since she was seven, leaving behind a trail of memories and broken hearts in each temporary home. 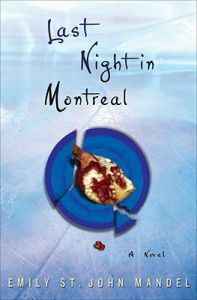 Eli is Lilia’s latest casualty, a nice boy who follows her trail from New York to Montreal. Also in pursuit is Christopher, an obsessed private investigator who leaves behind his own daughter. As the title implies, the novel dwells in the past. It’s a road novel through time, its morose protagonists sketched in spare, impressionistic prose. The atmosphere is better than the characterization. Mandel has an impressive command of the language of longing, but the lovers themselves feel more like rough drafts than human beings. Still, the pages fly, and the final period leaves a palpable sense of loss.